Det er mange stilarter i Norge og vi kan nevne noen; Shotokan, Gojoryu, Wadoryu, Kyokushinkai, Shitoryu, Shokukai, Shorinryu og Nanbudo. 1.Karate is not merely practiced for your own benefit; it can be used to protect one’s family or master. It is not intended to be used against a single assailant but instead as a way of avoiding a fight should one be confronted by a villain or ruffian. 3. Karate cannot be quickly learned. Like a slow moving bull, it eventually travels a thousand miles. 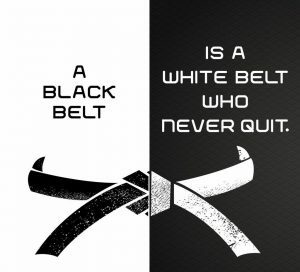 If one trains diligently every day, then in three or four years one will come to understand karate. Those who train in this fashion will discover karate. 4. In karate, training of the hands and feet are important, so one must be thoroughly trained on the makiwara. In order to do this, drop your shoulders, open your lungs, take hold of your strength, grip the floor with your feet, and sink your energy into your lower abdomen. Practice using each arm one to two hundred times each day. 5. When one practices the stances of Tang Te, be sure to keep your back straight, lower your shoulders, put strength in your legs, stand firmly, and drop your energy into your lower abdomen. 6. Practice each of the techniques of karate repeatedly, the use of which is passed by word of mouth. Learn the explanations well, and decide when and in what manner to apply them when needed. Enter, counter, release is the rule of releasing hand (torite). 8. When you train, do so as if on the battlefield. Your eyes should glare, shoulders drop, and body harden. You should always train with intensity and spirit, and in this way you will naturally be ready. 9. One must not overtrain; this will cause you to lose the energy in your lower abdomen and will be harmful to your body. Your face and eyes will turn red. Train wisely. 10. In the past, masters of karate have enjoyed long lives. Karate aids in developing the bones and muscles. It helps the digestion as well as the circulation. If karate should be introduced beginning in the elementary schools, then we will produce many men each capable of defeating ten assailants. I further believe this can be done by having all students at the Okinawa Teachers’ College practice karate. In this way, after graduation, they can teach at the elementary schools that which they have been taught. I believe this will be a great benefit to our nation and our military. It is my hope you will seriously consider my suggestion.